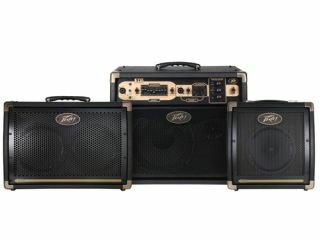 PRESS RELEASE: Peavey proudly announces the new Ecoustic E110, E208 and E20 acoustic guitar amplifiers, a trio of full-range, two-channel guitar amps with dedicated EQ on each channel and transparent solid-state preamps. The Ecoustic E110 provides 100 watts of clean power into a bi-amplified system containing a 10" full-range loudspeaker and a high-frequency horn. Both channels operate independently, with 9-band graphic EQ on channel 1 and two-band adjustment on channel 2, a Notch Filter and Phase Inverter on channel 1 to control feedback, footswitchable Mute/Tuner, and more. The master section includes digital reverb, chorus and delay with channel assignment and parameter adjustment, and the optional foot controller allows users to access up to eight presets plus an onboard looper. The Ecoustic E208 and Ecoustic E20 are rated at 30 watts and 20 watts, respectively, and have a compact, lightweight design that make them ideal for rehearsals. The Ecoustic 208 features built-in chorus and reverb, and both models include headphone outputs for quiet practicing.